Being in an open plan office is distracting - I’ve seen the brain scans to prove it! Your brain simply doesn’t work as well as it could. Have you ever found it hard to focus? Or struggled to find the space to give your brain time to think? If so, have you ever thought about sitting with a cardboard box on your head?! Believe it or not, one of my clients swears by this technique! Whenever he needs time to think, he pops a box on his head to help channel his thoughts. Now I’ll admit, this is a somewhat unorthodox way of helping you re-gain focus but by giving your brain time to think you can release the power of your unconscious mind, making spontaneous connections and thus increasing your productivity. Taking space is something we do automatically in our downtime and sleep, but frequently in the world of work and in our busy lives, we don’t have enough space, so the power of our unconscious is underused. We often feel it is irresponsible or lazy to give ourselves space, but that space is in fact, exceptionally productive. Space gives your unconscious brain time to think. Instead of constantly pulling information into your conscious brain, you take some space to ensure your brain can properly process and distil matters, enabling you to make new connections between seemingly unrelated thoughts — and allowing a bubble of insight to surface. Without space we’re simply not as smart! Taking some time out or downtime is an incredibly powerful aspect of the creative process. That space harnesses your brain’s power to come up with that lightning bolt of inspiration! 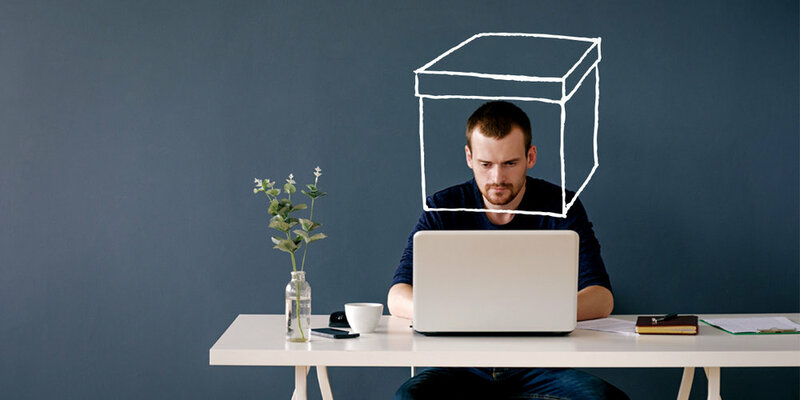 Whilst putting a cardboard box on your head may not be your thing, try building space into your daily routine. Get into healthy habits that work well for you whatever you’re doing and wherever you are. As a simple example, you might spend 20 minutes going for a walk after every 90 minutes of concentrated deskwork: this is taking space. Acquire good sleeping habits and good posture. Eat healthily and do regular exercise. Learn stress control and mindfulness practices. Enjoy life and be playful. Hug your partner. Appreciate humour, wit and laughter. Keep your brain active by doing puzzles and stretching your memory. Keep learning. And even on the busiest days you can always go and make a cup of tea!